After years of procrastinating I finally managed to visit one of the most spectacular parts of the Northern American continent, the Canadian Rocky Mountains. Most people visiting the Canadian Rockies start their trip either in Vancouver, which is the main gateway to the Canada’s west, or in Calgary, which, just an hour drive from Banff, is the closest big city to the mountains. We however decided to start in Edmonton as flights there (via Iceland) were significantly cheaper than to anywhere else in the region. 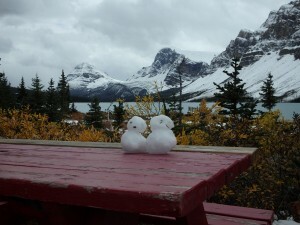 Edmonton welcomed us with grey and rainy weather which reminded us of London so we didn’t linger and after a night in cheap motel drove straight west to Jasper which is located over 350km (220 miles) away. It takes well over 3.5 hours to drive there and once you leave the suburbs of Edmonton it is an absolutely featureless drive for the first two to three hours (especially in a heavy and relentless rain). On our way we passed just a few small settlements and lots and lots of forest. Drives like this really help to understand how huge Canada is. On the map of Canada Edmonton seems to be almost on the footsteps of the Rockies but in fact you could fit half of my native Poland in that space. Or actually quite a few smaller European countries. Luckily as we were approaching the mountains the weather cleared somehow so we could admire some views. There were still a lot of low lying clouds but it stopped raining and there were even glimpses of sun. In those precious moments we could see the crazy colours of the glacial rivers flowing from the mountains. 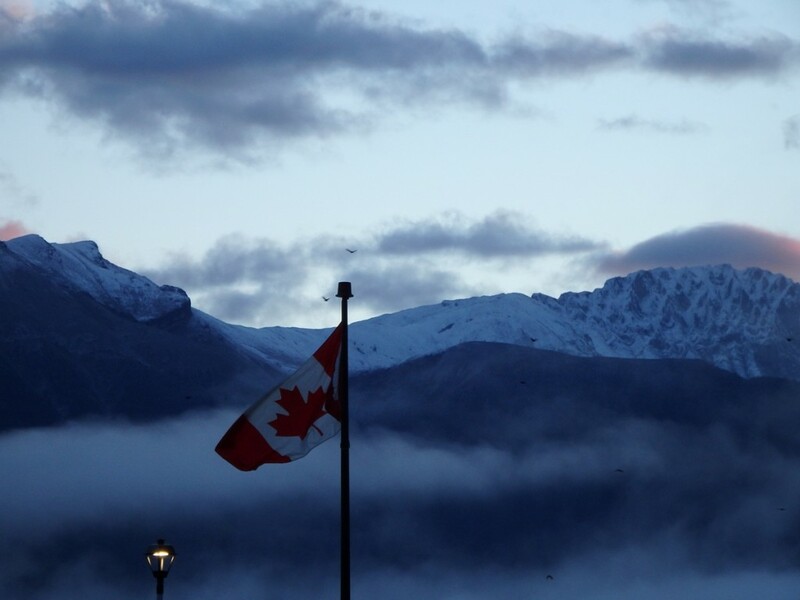 Jasper is a small town at the heart of Jasper National Park but its population, counting just over 4000 souls, can swell enormously during the high season. 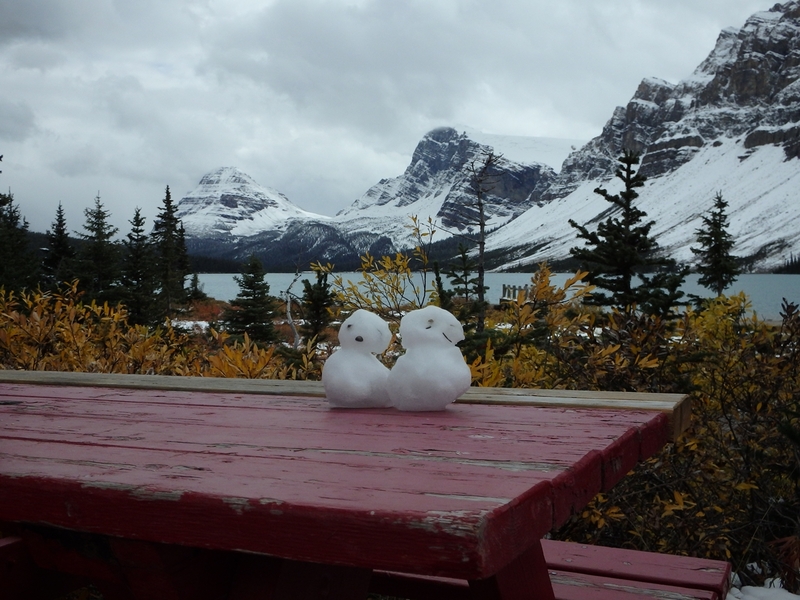 For that reason we preferred to gamble with the weather and arrive there in late September to avoid the crowds. It seemed to work as the town was quiet and peaceful but not totally dead. We checked into our hotel and immediately hit the road again trying to enjoy the decent afternoon which was just developing. 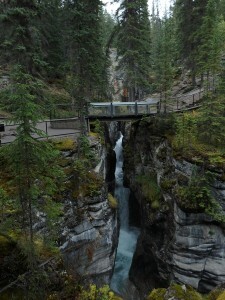 Our first stop was Maligne Canyon just a short drive from the town. It is nothing on the scale of the great canyons of the American Southwest but it is still an impressive sight and a great example of karst topography. 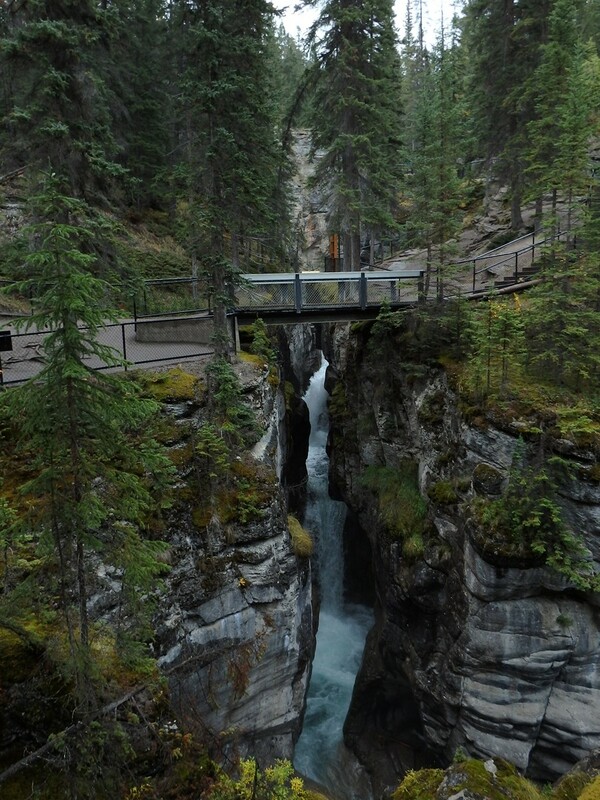 Maligne River, flowing partially underground just above the canyon, eroded this chasm which is up to 50 meters deep but, in some places, only 2 meters wide. We walked along a very pleasant trail following the canyon and crossing it several times via high footbridges which offered great opportunities to look into the depths of the gorge. From the canyon we drove a few kilometres up the valley to Medicine Lake which is not actually a lake at all but a geologic anomaly; it is an area into which the Maligne River backs up before suddenly disappearing underground. During the summer months, during intensified meltwater runoff, the lake (which during the winter months is just a meandering frozen river) fills to levels which fluctuate over time and with the runoff events. Much like a bathtub that is filled too fast for it to drain, it fills with water until the flow of water (in this case the meltwater runoff) reduces in late summer and it slowly drains again. As we visited the “lake” in September it was already much diminished but we could see where its waterline extends during the spring. Well over 10m higher than the level we saw. 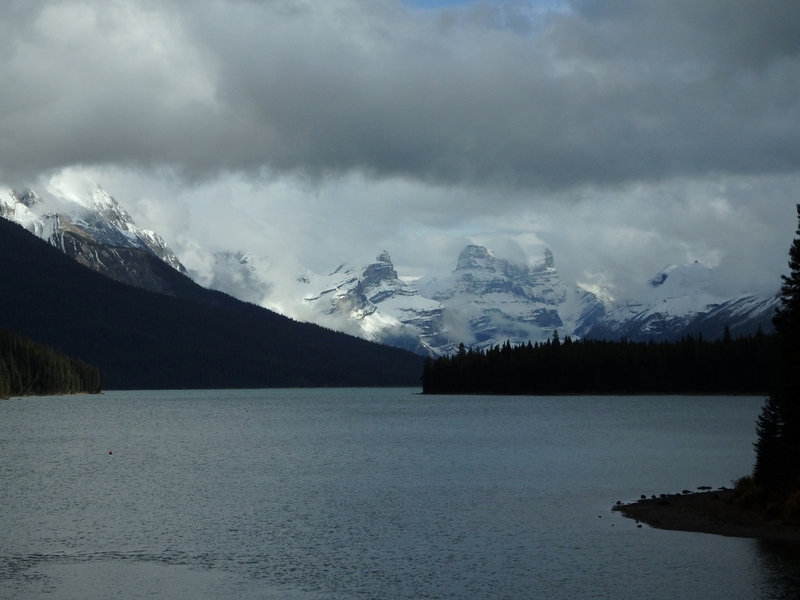 Finally, we followed the valley up to the end of the road at the banks of the Maligne Lake. On the way up we encountered dark clouds, fog and even a few snowflakes but luckily a few minutes after our arrival the weather cleared again. We wrapped up (the lake is located 1670m above the sea level and we could feel it) and walked along its banks for a while. The views across the lake are truly spectacular. I found it almost impossible to stop taking photos, especially as the changing light and moving clouds constantly played with the spectacular mountain landscape. But it was getting late and cold so we decided to head back to Jasper town as the last thing we needed was to get stranded if the weather turned really bad. We spent the evening in a cheerful local pub enjoying some Canadian beer and whisky before going to sleep early. The next day started really early. We woke up before the sunrise and had breakfast at 7am, basically as soon as the local bakery/cafe opened. There were two reasons for that. First, we were not yet completely adjusted to the time difference from Europe and second, we had a lot of ground to cover that day. We headed south from Jasper town and joined one of the most spectacular roads on earth, the Icefield Parkway. 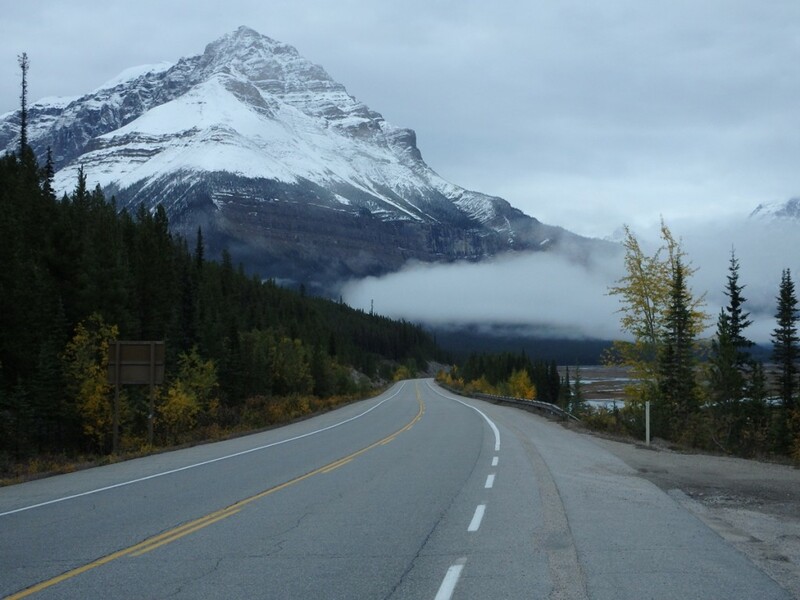 Completed in 1940 this 232km (145 miles) long route parallels the Continental Divide and links Jasper with Lake Louise in Banff National Park. Like the Pacific Coast Highway in California it is one of those roads where one has to work very hard trying to concentrate on driving as the landscape is simply amazing. With every turn there is a new breathtaking vista opening up and wherever you look there are impressive wild mountains. It is one of these experiences which I find impossible to describe. I could post 10, 50, 100 pictures here and still it wouldn’t do it a justice. We kept stopping every few kilometres to take more and more photos and simply to admire the views but our first longer stop was at the Columbia Icefield just over 100km from Jasper. There is a huge visitor centre there, clearly designed to deal with the busloads of people coming there in the high season and once again we were thankful we came off season. We headed straight for the trail leading to the the face of the Athabasca Glacier which is one of the principal “toes” of the Columbia Icefield, the largest icefield in the Rocky Mountains. To get onto the glacier itself one has to be driven there in special vehicles or join a guided tour. Both options were quite pricey and our time was limited (as we were planning some hiking in the Lake Louise area) so we just walked along the trail close to the Athabasca Glacier face which was still the closest I have ever come to any glacier. Along the trail and along the road to the parking lot there are clever signs indicating where the glacier extended to at different times in the past. It is incredible to see how much it has retreated in the last 100 years. Then we headed south again. 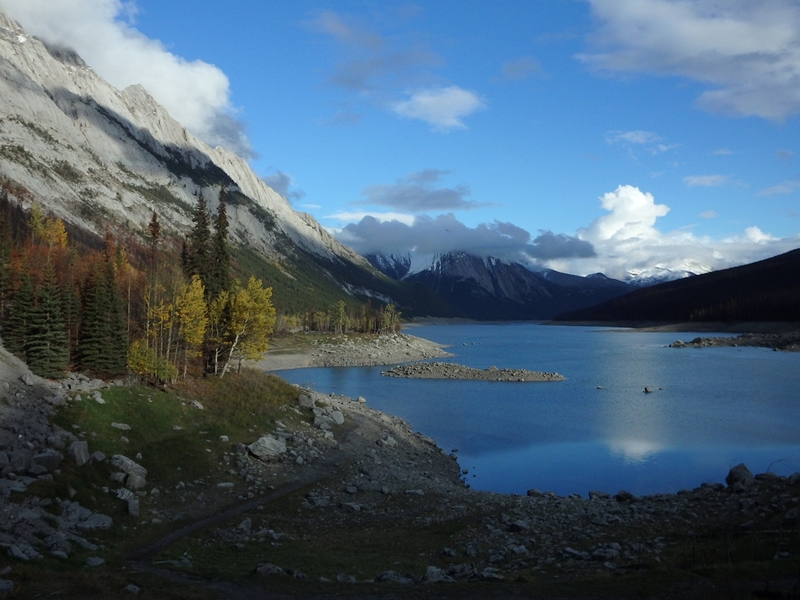 After stopping for lunch at Saskatchewan Crossing, which is the only gas station and one of the few places serving food along the parkway, we reached the Bow Pass. At an elevation of 2068m (6785 feet) above sea level it is the highest point along the Icefield Parkway (and the highest public road in Canada). 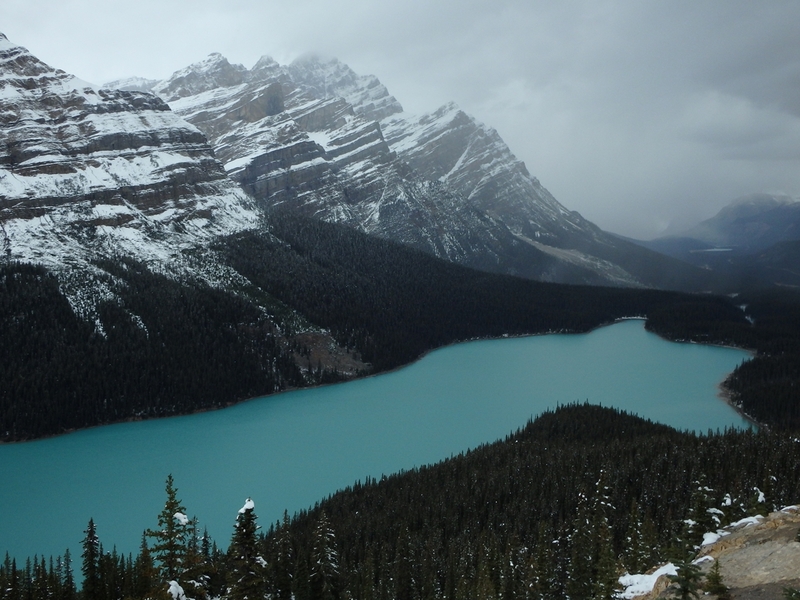 From the pass a short road and a trail lead to a viewing point overlooking the stunning Peyto Lake that is a crazy turquoise colour due to significant amounts of glacial rock flour flowing into it. At that elevation there were a few cm of snow on the ground and it was really cold. On top of that a tour group which reached the viewing point soon after us unceremoniously shifted us aside (have you aver experienced older ladies using elbows?) and started taking countless selfies so we decided to leave and sped straight to Lake Louise. Actually our “speeding” involved one more stop, on the banks of Bow Lake, where we had hot tea and biscuits in the Num-Ti-Jah lodge. Finally, in the early afternoon we arrived at the banks of the intensely turquoise Lake Louise right beside the enormous (and quite ugly) Fairmont Chateau Lake Louise Hotel. It is an absolute monstrosity and with its huge parking lots and crowds strolling along the banks of the lake it all made us want to escape ( I don’t even want to think how bad it can get there in summer). Luckily it is easy to do as there are some great hiking trails starting by the hotel. 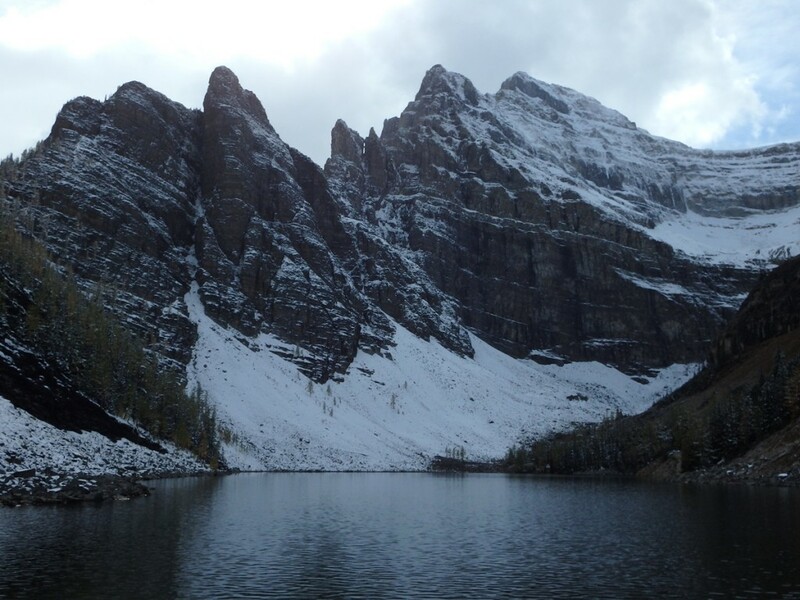 We chose to hike to the Lake Agnes Teahouse via the Little Beehive overlook and after leaving the lake and climbing for few hundred meters the crowds were a distant memory and we could enjoy the mountains again. For most of the distance the trail goes through the forest but at the Little Beehive there are fantastic views of the Bow Valley and Lake Louise. Once we got there we experienced a mix of sunshine and snowfall which really played with the landscape making everything look a bit haunted. 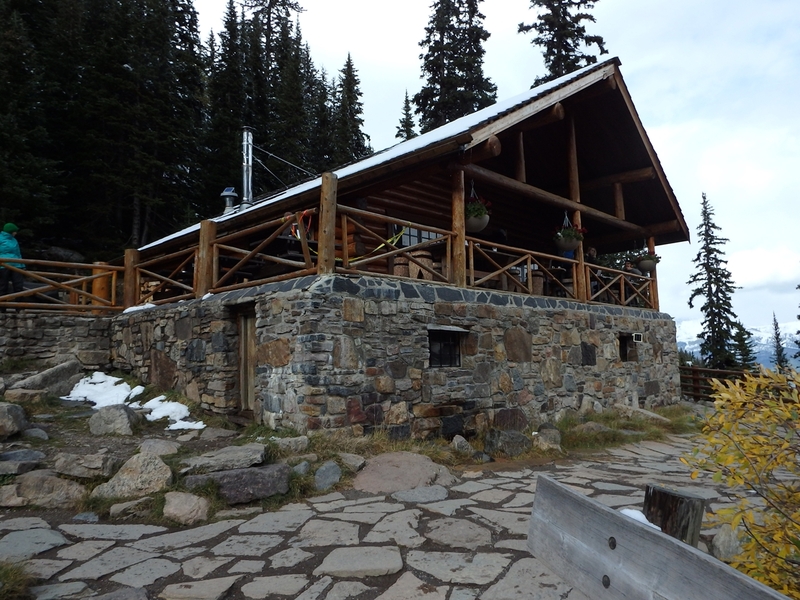 On the way down we stopped in the teahouse at Lake Agnes for a well deserved hot beverage and some cake. The isolated teahouse is manned by a team which stays there for a few nights at the time as there is no road access. The bulk supply come by a helicopter at the beginning of the season while the perishables travel on the staff’s backs when the shifts change. It is a great little place, peacefully located on the banks of small but stunning lake. Birds and chipmunks were playing around collecting crumbs and begging for more leftovers while the sun was getting low. Unfortunately it was time to head back down. The trail to the teahouse via Little Beehive is about 9km (5,5 miles) long (return) and involves about 500m (1640 feet) of elevation gain. I highly recommend it to anyone visiting Lake Louise. After getting back to the car we joined the Trans-Canada Highway and headed west to Kicking Horse Pass (what a great name) and further to British Columbia. 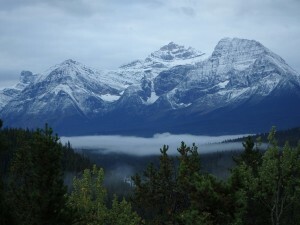 But that’s the subject for another story as we were leaving the Canadian Rockies. I have to say I loved every minute we spent there. Sure the weather wasn’t perfect but the autumnal feel we had experienced added something to the perception of the place. True, the landscape is stunning in every weather but trees with leaves changing colours, the dusting of snow on the mountaintops, ominous heavy clouds and patches of fog in the valleys as well as the chill in the air, made the mountains feel more wild than they would seem in the glorious mid summer sunshine. On top of that we avoided crowds on the trails and traffic jams caused by thousands of RVs descending to the region every summer. In my opinion autumn is the best season to travel in this region. This entry was posted in Uncategorized and tagged Athabasca Glacier, Banff National Park, Bow Lake, Bow Pass, Columbia Icefield, Icefield Parkway, Jasper, Lake Agnes Teahouse, Lake Louise, Maligne Canyon, Maligne Lake, Maligne River, Medicine Lake, Peyto Lake, Trans-Canada Highway on February 3, 2016 by admin.